NEW YORK — Entering the Intrepid Sea, Air and Space Museum's new "Space Shuttle Pavilion," which opened in New York City on Wednesday (July 10), visitors are first greeted by the sound of astronauts exchanging radio calls with flight controllers about guiding a winged spacecraft to a safe touchdown. The late-1970's audio recordings, which capture the critical approach and landing tests that preceded 30 years of U.S. space exploration, juxtapose the start of the space shuttle Enterprise's use as a NASA prototypewith its final role — located just a few more steps into the new pavilion — as a public attraction and educational exhibit. Then, just three months later, Hurricane Sandy hit New York City, flooding the pier where the Intrepid is docked. 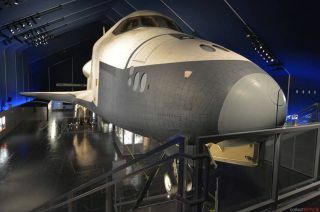 The museum's original Space Shuttle Pavilion relied on air pressure to maintain its shape, so when the "superstorm" knocked out all the power, the enclosure deflated and was ultimately damaged beyond repair. Enterprise was damaged, too. Its vertical stabilizer, or tail, was caught by the punctured pavilion and its tip broke off. Fortunately, the piece was recovered and reattached. Wednesday's ribbon cutting for the re-launched attractionincluded only a few local NASA center officials and none of the astronauts who were present for last year's opening. Though the fanfare was diminished, the enthusiasm was not, as the Intrepid's curators welcomed the waiting public inside. "We are thrilled," Elaine Charnov, Intrepid's vice president of exhibits, told collectSPACE.com in an interview. "[This] establishes ... that we're recovering from Hurricane Sandy, but also continuing the educational venture that Intrepid is all about." The shuttle pavilion sits on the aircraft carrier's flight deck. Enterprise itself, is mounted 10 feet (3 meters) above the deck, high enough that visitors can walk underneath it to view its deployed landing gear and mock heat shield tiles. Although constructed with an airframe identical to one of its space-flown sister ships, Enterprise was never made space-worthy. It was only used for atmospheric flight tests and ground-based trials. Guests desiring a closer view of the orbiter can ascend to an observation platform offering a nose-to-nose encounter with the test shuttle. The previous pavilion provided a raised-level view as well, but it quickly became crowded. The new exhibit features a larger platform. "The expanded viewing platform is to enable the public to get a little bit closer and to accommodate more people at a time," Charnov said. Enterprise is also no longer the only spacecraft to look at. "We are super excited that we've now brought Soyuz into the pavilion so we can tell the comparative story about the two different space vehicles, which to some extent shared parallel missions," said Charnov. Moved up from one of the Intrepid's lower decks, Russia's Soyuz TMA-6 capsule sits nearby the much larger shuttle. The three-seat spacecraft visited the International Space Station in 2005. Its return crew included Greg Olsen, who paid his way to orbit as a so-called "space tourist." Olsen now owns the spacecraft and has loaned it to the Intrepid for display. Enterprise's sister space shuttles were retired to other museums in 2011. Since then, NASA has relied on Russia's Soyuz to ferry its astronauts to and from the space station. The space agency intends to hire private space companies to resume U.S.-based manned launches as soon as the new commercial spacecraft become available in 2017. Visitors to the Intrepid Sea, Air and Space Museum's new "Space Shuttle Pavilion" can come nose-to-nose with Enterprise atop an expanded platform. During the months that Enterprise's pavilion was closed to visitors, the Intrepid set up a temporary exhibit of artifacts and memorabilia aimed at recounting the orbiter's role as a pioneer. Those objects and more have been incorporated into the newly-opened display. "We had already intended, now that [Enterprise has been here] for a year already, to add new content and stories," Charnov explained, adding that the storm-forced redesign provided the opportunity for that expansion. "In contrast with the last exhibition, which was really about telling a story through lightboxes and captive frame grabs all along the walls, this gave us the opportunity to pause and recognize that this pavilion is massive — it's actually about a 19,000-square-foot stage — and people are going to be experiencing it in their own way and their own time," she added. Rather than have guests follow a single narrative exhibit, the displays are now divided into zones, with each sharing a different aspect about the space shuttle and Enterprise. New exhibit areas inside the pavilion employ artifacts and multimedia to provide a closer look at the interior of the orbiter's interior, examine the space shuttle's influence on pop culture, and illustrate the 30-year program's impact on everyday life. The exhibit also highlights the team of people who worked behind the astronauts to make sure that each mission was a success, as well as provide visitors an updated look at NASA's current and planned activities. "We are really trying to celebrate history but also connect the public to what is going on now and what are some of the visions for the future," Charnov said. "Because history should be active."